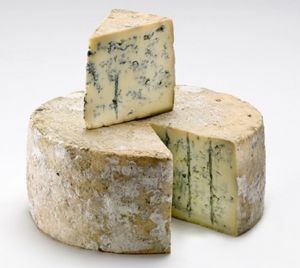 Bleu des Causses has a high fat content of 45% and is matured for at least seventy days. However, the cheese can also be matured for up to six months in Gorges du Tarn's natural limestone caves to develop a full and fine flavor. The cheese is similar to Blue d'Auvergne in many ways, despite Bleu des Causses having a noticeably firmer, creamier texture and spicy flavors. Bleu des Causses produced in winter and summer slightly differ in texture and flavor. Cheeses made in winter are light in color than their summer equals. The winter produce also tends to be slightly drier. A taste of the Bleu des Causses will proffer a blend of rich milkiness amidst the peppery and spicy notes of the blue mould. The summer produce bring out their unique grassy and clover flavors. It pairs excellently with sweet white wine and dessert wines such as Sauternes or Mulderbosch Late Harvest Sauvignon Blanc.